Ani's Book Abyss: Halloween Bingo 2017 | Ani's Tentative Reading List! Halloween Bingo 2017 | Ani's Tentative Reading List! Moonlight Reader and Obsidian Blue are at it again with another reading game to spice up our reading lives! Another Halloween Bingo with a slight twist, including custom cards for each participating player, as well as actual Bingo square calls every other day starting September 1st! 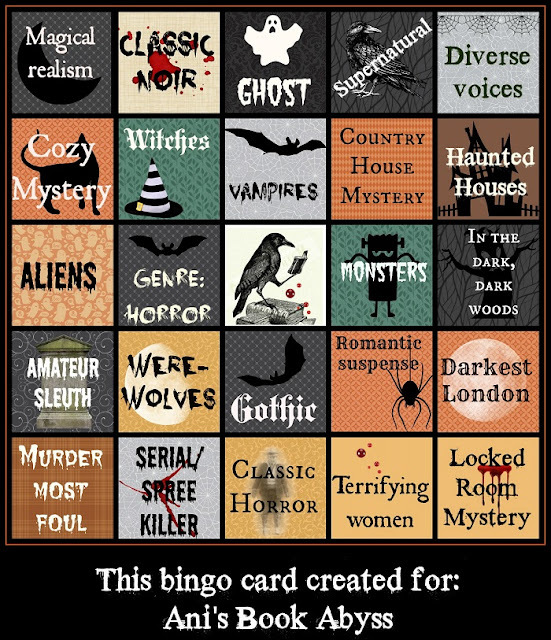 The basic new twist is that our game masters have created 31 possible Bingo squares to choose from, and we can request which squares we want to have on our card, or just ask for a specific focus, such as mystery or horror. Moonlight will then create for each player a customized Bingo card, and then, as already stated, they will call a new square every other day. A game square will only count as complete if A) it has been called, and B) a book has been read for it. But, we do not have to wait for a square to be called before reading a book for it--so you can simply read a book for a square, and then sit back and wait for it to be called! For more information on the game play, see the Halloween Bingo Rules and Other Information. For some short descriptions for all 31 squares created, see Moonlight's Halloween Bingo Squares post. Meanwhile, I've already been making a tentative listing of books I'd like to read for my own customized Bingo card above, courtesy of Moonlight Reader and picmonkey! Thanks Moonlight! Tentatively, this is what I'm planning on reading, four books of which are from my 2017 Reading Assignment list, and most of the other books are pre-owned TBR, and seriously just need to be read. Please excuse my drawn out ramblings. -- I have had this book for a very, very long time and have never read it. As I read through the summary, it struck me that this particular book could count as magical realism. I had considered reading this book for the Diverse Voices square, as well, so if it doesn't seem at all like magical realism, I might shuffle it off onto some other square. -- I've never read books in this genre before, but am open to trying something new. Also, keeping this square allows me to cut out some of the 'horror' squares, and I'm more partial to mystery anyway. The first group read for September will hopefully find me a nice book I can read for this square! -- There are a lot of possibilities for this broad category, but I have recently acquired a lot of Nora Roberts books and would like to get through them. I read something by Nora Roberts for last year's Halloween Bingo (Dark Witch), so it wouldn't hurt to read another something (or three somethings) for this year's bingo. -- The Nightmare Charade is a book off of my Reading Assignment list, and this, unfortunately, is the only square it will fit on the card (unless I use the Free Space, of course). And yes, I DO want to have it read, as I've been planning to read it in either September or October for the longest time now. Otherwise, there are many other possibilities to pick from. -- This was the next book I thought about after the Amy Tan book listed above. In fact, if Saving Fish From Drowning does not actually work for Magical Realism, then I may just shuffle it back down here. But, in the meantime, I AM quite interested in reading The Lotus Palace, a book written by an Asian author, that takes place in historical China, and is a mystery novel as well! -- Oh, the possibilities for this game square! There are any number of cozy mysteries that I am quite interested in, so the above may not be my final choice. It is just the first book that popped into my mind when I thought of cozy mysteries. -- I am not a hundred percent familiar with witch books, but I think I should be able to find something. If all else fails, I think Nora Roberts has a few books about witches. There are two books in particular that I own that have a witch, so I may just pick one of them. -- I'm not big on vampire books, so I had considered doing a Dracula reread via the full-cast audio that I own. Then, while I was going through my shelves, I stumbled upon this little gem by Deanna Raybourn, of which I had just purchased with an Audible credit not long ago. The book takes place in Transylvania, and there is talk of creepy castles and charming vampires. I'm totally reading this one for this square! And to think, I almost decided to exclude it from my choices! -- The truth is, I'm not sure I know what a 'Country House Mystery' is, but I'm willing to find out. Recommendations are welcome! Though one of the books I found that was listed as a popular country house mystery was Agatha Christie's The Mysterious Affair at Styles. I'd been meaning to get some more of Dame Agatha's work read. What does everyone else think? -- Once again, the possibilities are endless. But I'm starting a trilogy, and I'll be damned if I leave another series unfinished for a long time. Black Rose continues the the trilogy, In the Garden by Nora Roberts, following behind Blue Dahlia, and there is talk of a ghost being present in the setting of the book's house for over a hundred years. I'd call that a haunted house! -- I don't know why I kept this square, however, I DO have one book that will definitely fit, if nothing else will. For the meantime, I'm going to keep my options open, but chances are, I'm going to read my one and only possibility for this game square so far: The Intrigues of Haruhi Suzumiya by Nagaru Tanigawa. You wouldn't think that this book would fit, but one of the characters is an alien, even if not the creepy weird aliens of space invaders and horror. -- Halloween wouldn't be complete without a book by Neil Gaiman. Smoke and Mirrors is a short story collection that is tagged as 'horror,' so I'm going to go with that. The summary gives a great description that comes off kind of horror-like anyway. Again, this is a tentative pick, I might change my mind later if I stumble upon something else. But I own this in audio, so the chances of me changing my mind is a bit slim. -- I can't find another spot to place this book so that I can finish off the trilogy. So it will go here unless I can find a different place for it that I don't already have another book lined up for. One possibility: His Majesty's Dragon by Naomi Novik -- because, dragons. Another possibility: The Color of Magic by Terry Pratchett -- because giant turtles, and dragons. -- because, fantastic beasts and mythical/magical creatures... which probably include dragons. -- I picked up about three Victoria Holt books from a library sale a long time ago and have been looking for a chance to introduce myself. Ever since my first Gothic romance, I've been paying more attention to author names that come up in connection with the genre. On the Night of the Seventh Moon's summary mentions something about the significance of a forest. I'm going to go with that. -- I have a feeling that this category was created probably for a cozy mystery of some sort, where the protagonist is often times NOT in law enforcement. But as the description isn't entirely restrictive, I decided to go with another Reading Assignment selection, wherein there is a mystery, there is a murder, and the protagonist is a psychologist. -- I probably have the same love for werewolf books as I do vampire books, but if I were honest, I'd be more likely to pick up a werewolf book than a vampire book. So this square remained in my choices, and now I'm trying to figure out which of my wolf shifter books I want to read... if wolf shifter = werewolf, that is. -- There are a number of books that I'm considering reading for this space, if only because I'd recently been drawn to Gothic romance and the genre appeals to me. I've been shuffling around possible books by Mary Stewart, Susanna Kearsley, Simone St. James, and maybe even Kate Morton. On the other hand, I DID pick up three Victoria Holt books at a library sale, and having already chosen one for one of my game spaces (see Dark, Dark Woods), I have two more I could try. So this is a tentative selection. -- Frankly, this is a 'Free Space' for me since romantic suspense is my go-to genre. I have so many possible picks that I my biggest problem is figuring out which book I want to read for this category. So, to make life easier on myself, I went and chose one more Reading Assignment book, one of the books that I kept telling myself I wanted to read during the summer, but because of REASONS, I never got to it. I'm not even going to give myself other possible reads, because I'd just end up becoming wishy-washy in my choices. How much we want to bet that I'll end up changing my mind and reading something else anyway? -- I had a few books I was interested in reading for this space until I realized that the books I'd been choosing were set in England, but not in London. Well, that ended up being a problem I figured I could easily remedy, so another search had to be done. And would you look at that? Goodreads has a nifty list I decided to peruse: Books Set in London. However, since that list has anything from contemporary romance to Paddington Bear, I decided to do a more narrowed search of 'mysteries set in London' and came up with this list: Best London Mysteries. -- So I'm not entirely certain if this book fits--the summary mentions a murder, the book is tagged 'mystery.' I really DO want to read this book (or rather, listen to it since I have it on audio). But I'm not entirely sure that this is a murder mystery, per se, because some parts of the summary hint that this is a death that occurred in history. Nonetheless, I obviously have a lot of books to choose from considering how broad a category this one is, requiring only that we read a murder mystery, any murder mystery. So I might just include a few alternate options. -- Another category that has a lot of possible books I could read. But to keep things simple, I'm inserting another Reading Assignment book on this space. Dear Maggie's summary mentions the presence of a serial killer--that's good enough for me. I don't know what to pick. Maybe a reread of Dracula, although, the truth is, I'm sort of waiting out for the October group read and will probably just use it to fill this square since the group reads are wild cards. -- I've only done a cursory search of the books that would fit this category and narrowed my choices down to a few, though I'm not entirely sure what I want to read. All of these titles I found at the Goodreads Locked Room Mystery list.